As you read the literature on leadership, you soon realize that there are many theories on leadership’s defining characteristics and its practices. The following three theories of Leadership are the most prevalent ones. Developed in the 19th century, this model was promoted by Scottish philosopher, writer and teacher Thomas Carlyle. Its premise was that leadership is based on the individual who was born for great things (good or bad), Napoleon being one example. Leaders were identified by their acts and accomplishments. 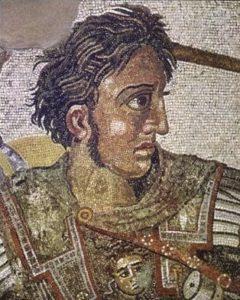 Alexander the Great conquered the known world. Genghis Khan then ravaged most of it. Abraham Lincoln freed the slaves. Harriet Tubman saved hundreds from slavery in the Underground Railroad. Mother Theresa aided and comforted thousands in Calcutta who were abandoned by society. The theory is that these people accomplished great things because fate determined they were great people and they were simply fulfilling their destiny. Eventually the Great Man Theory was abandoned in favor of the theories based on behavioral science. Honesty —Display sincerity, integrity, and candor in all your actions. Deceptive behavior will not inspire trust. Competent —Base your actions on reason and moral principles. Do not make decisions based on childlike emotional desires or feelings. Forward-looking —Set goals and have a vision of the future. The vision must be owned throughout the organization. Effective leaders envision what they want and how to get it. They habitually pick priorities stemming from their basic values. Inspiring —Display confidence in all that you do. By showing endurance in mental, physical, and spiritual stamina, you will inspire others to reach for new heights. Take charge when necessary. Intelligent —Read, study, and seek challenging assignments. Fair-minded —Show fair treatment to all people. Prejudice is the enemy of justice. Display empathy by being sensitive to the feelings, values, interests, and well-being of others. Courageous —Have the perseverance to accomplish a goal, regardless of the seemingly insurmountable obstacles. Display a confident calmness when under stress. Straightforward —Use sound judgment to make a good decisions at the right time. Imaginative —Make timely and appropriate changes in your thinking, plans, and methods. Show creativity by thinking of new and better goals, ideas, and solutions to problems. Be innovative! Scholars such as Kouzes and Posner stated that we all have some ability in several leadership qualities and skills. That under the right circumstances, anyone can rise to a leadership role and be successful, based on the leadership style that best matches their personality if they know how to use that ability to properly address the situation at hand. Other leadership skills can be learned, developed, and mastered. The overall process identified by K & P is clearly transformational in style, which has a strong focus on followers. 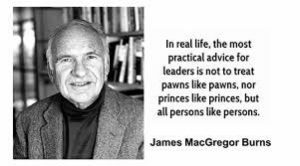 In 1978, James MacGregor Burns introduced the concept of transformational leadership in his research on political leaders. Burns theorized that “transformational leadership” is actually a process where leaders interact with their followers and inspire each other to advance together. His characteristics and behaviours demonstrated the differences between “management” and “leadership.” People and organizations are transformed due to the leadership style and abilities of the leader, who is able to convey a vision and guide the transformation. Bernard M. Bass, in 1985, added to Burns’ transformational leadership theory by shifting the focus to the followers. It is not the individual traits and vision of the leader that matter as much as it is their ability to influence the feelings, attitudes, and commitment of their followers. If followers feel they can trust a leader (or better yet, if they admire a leader who can stimulate a sense of loyalty and respect by inspiring a shared vision) the followers go happily exceed their original expectations. As a result, productivity increases and conflict decreases. The followers are transformed by a charismatic, motivational leader. The above are just three of many leadership theories. Some of the others are Participative (Lewin), Situational, Contingency and Transactional. Through all of the research, there are a variety of attributes and abilities associated with leadership, and these vary from leader to leader. Some leaders are great orators, others great writers. Some leaders are very quiet, but the force of their logic or passion causes them to stand out. I have come to understand that the difference between a good leader and a great leader is not only based on the leadership skills they have developed but also on how often and in what manner they demonstrate them. ← Is Influence The Soul of Leadership?